The 'ornithologist, philatelist, philanthropist' (front left) at Penn U. The historical facts are unedifying and abstruse. John Eleuthère du Pont was an heir to the du Pont family fortune, his personal fortune assessed at about $200m (U.S.). A decidedly odd fellow, he was nevertheless a man of some accomplishment as an ornithologist, philatelist, philanthropist (and fantasist). He was also a sports enthusiast and established a wrestling academy at the family estate for a tilt at the Olympics. It was in pursuit of this that the Schultz brothers, world and Olympic wrestling champions, came to live on the du Pont estate, Foxcatcher Farms. The relationship seems to have been interesting, with Dave Schultz acting as de facto head coach to the team, which may have stoked some resentment from du Pont, who compounded his emotional volatility with substance abuse. On 26 January 1996, du Pont, with his security chief, drove to a house on the estate occupied by Dave Schultz and his family. Winding down the window, he apparently said to Schultz, “Do you have a problem with me?” shot him 3 times and drove away. After a two day siege conducted by police with due restraint, du Pont was caught and convicted of 3rd degree murder, reflecting his diminished responsibility, and he died in prison in 2010. 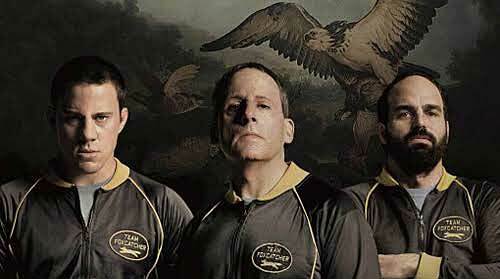 Foxcatcher is an attempt to replay and explain all of this. Two key problems arise. First, the credible portrayal of mental illness/personality disorder, particularly as a causal phenomenon, is next to impossible. Anthony Perkins managed it with gulping and twitching in Psycho, but he had substantial help from Alfred Hitchcock, Robert Bloch, Joseph Stefano and Sigmund Freud. 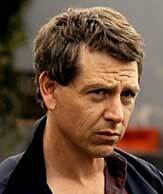 Ben Mendelsohn somehow did it in Animal Kingdom, without any tricks or script assistance. But usually it misses, as here. The film is handsomely shot. There are some great set pieces. The bond between brothers is movingly done. The wrestling looks authentic (if you like that sort of thing). The three key performances are good – Tatum Channing as a knot-headed Mark Schultz, Mark Ruffalo as the kind, super-competent and doomed Dave Schultz, and Steve Carell (despite being lumbered with an oversized false proboscis) as Du Pont. Anthony Michael Hall, Sienna Miller and Vanessa Redgrave are effective in small roles. But the other problem is that this is no high tragedy. Du Pont was no sturdy ‘stem of victorious stock’; he was a thin reed, of ambivalent sexuality and true oddness of the born rich. (One can see his weirdness and barely suppressed tyrannical nature in the You tube clip of him ‘outsmarting’ a fish at his little pond at Foxcatcher. You can also see how cannily Carell evokes du Pont’s clipped speaking style, a strange conversational cadence, and his essential lonely nerdiness, what a well known Australian sports-caster called a ‘delusion of adequacy’). So in the final analysis, you wonder why they bothered with this trite exercise in haute psychopathia. The combined talents should have aimed higher. How about a biopic of Abu Bakr al-Baghdadi?